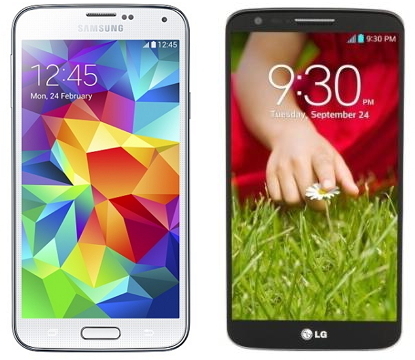 Samsung Electronics and LG Electronics are gearing up for a battle over high-resolution smartphone displays next month. Samsung is set to unveil its 5.2-inch Galaxy S5 Prime with a quad high-definition (2560x1440) display in June, according to recent media reports. “Samsung Electronics was supposed to use a QHD display for its Galaxy S5, but it failed due to the high cost. As the Galaxy S5 Prime will be rolled out in small quantities, it is highly likely that QHD will be adopted,” said an anonymous source from Samsung. Samsung’s organic light-emitting diode QHD display is more difficult and costly to make than LG’s liquid-crystal QHD display. The Galaxy S5 Prime will reportedly undergo an interoperability test this week to demonstrate that it is ready for the market. Such tests usually take one or two months. LG Electronics also said it would unveil its new marquee smartphone, the G3, with a QHD display at the end of May or beginning of June at its earnings briefing last Tuesday. LG plans to hold global events to promote the G3 in six cities including London, New York and Seoul from May 27 to 28. “The G3 will hit the global market within a month after it is rolled out in Korea,” a source said. LG Electronics is set to unveil its new smartphone earlier than expected to reportedly avoid competition with Apple’s iPhone 6, which will be rolled out in September. However, it will still face tough competition from its archrival Samsung. “If Samsung’s Galaxy S5 Prime hits the market in June, it may be unfavorable to LG as the demand for high-end smartphones will be split,” said Lee Min-hee, an analyst at I’M Investment and Securities. China’s handset maker Vivo beat Samsung and LG to the punch by releasing smartphones using a QHD display last December. However, Samsung and LG’s premium handsets are expected to set off a high-resolution war, considering their influence in the global smartphone markets. Fierce competition is also expected in the domestic markets, where local telecoms’ business suspensions will end in May. Sales on the home turf account for less than 10 percent of Samsung and LG’s total smartphone sales. However, tech-savvy Korea is still an essential test bed for the company as it hopes for a soft landing in the European and North American markets.